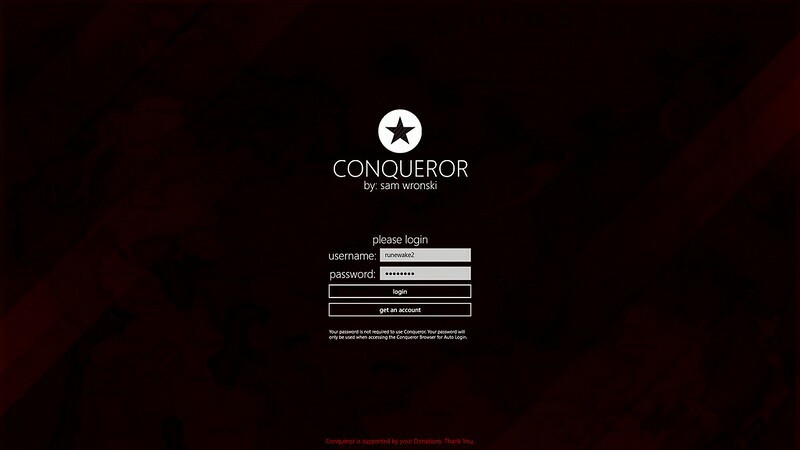 Conqueror is coming to a whole new group of computers and tablets in the next week or two alongside the release of Windows 8.1 on the 18th of October. This will be an app specifically tailored for both tablets and computers with larger screens than phones with a well designed and fluid layout. You may view a number of screenshots of the current beta test build I am running on my Flickr account here. This includes full images of the screens shown below. The main view showing your current games with quick access to each games information and a quick link directly into the game. Conqueror on Windows 8 relies upon the same backend as my Windows Phone app which means that it is using a backend which has been tested constantly over the past year and a half and that bugs detected/fixed in Windows Phone will be fixed in the Windows 8 version as well. 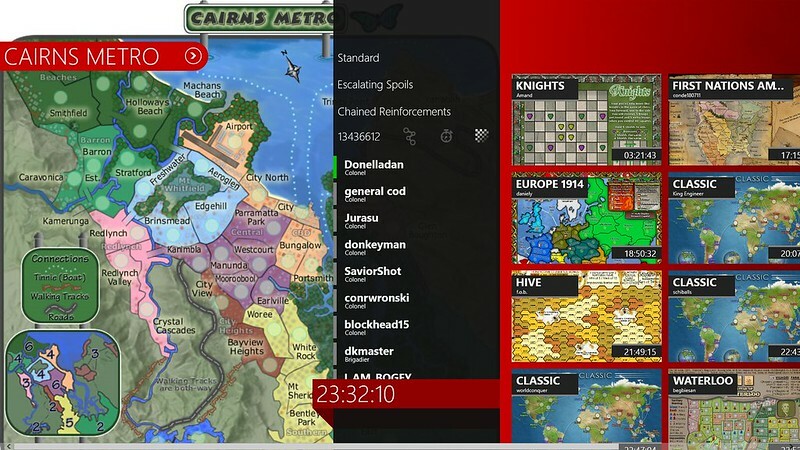 Unlike the Windows Phone version, Conqueror on Windows 8 offers a few new features. The first of course is the updated UI which is designed specifically to feel like a natural Windows 8 application. Additionally a more fully featured browser makes it easier to play your games on the go and the auto login feature added to Conqueror for Windows Phone in version 4 has been brought to Windows 8. The significant changes are what happens in the background. You can now set Conqueror to show a notification on your PC's lock screen so you will be able to quickly and easily see when your up in a game. There are a whole slew of other things that are being added to Conqueror for Windows 8 as well, however, they are still being flushed out. The entire feature set, UI etc are all subject to change before the release. I hope to release Conqueror for Windows 8 with Windows 8.1 (October 18th), however as I am still weeding out a few bugs with the program that may not be the case. I will know by the end of the weekend. Last edited by runewake2 on Mon Oct 22, 2012 5:58 pm, edited 4 times in total. Looks like a sweet app. Almost wish I had a Windows phone. chapcrap wrote: Looks like a sweet app. Almost wish I had a Windows phone. This will not necessarily require a Windows Phone chapcrap. It will also work on a Windows 8 PC. This may be a Windows 8 Tablet such as the Surface or a PC running Windows 8. I'm trying to cover the entire span of Microsoft devices with this app so that almost anyone, except those with only Apple or Linux machines, will be able to use it. I'd also add support for Windows 7 and below, but I believe an app called Firefox/Chrome/IE/Opera does that. I'm aiming to have this app released by the time Windows 8 is released, which will be before the end of October. I expect that I will have beta versions out long before that for anyone running the Consumer or Release previews of Windows 8. I should also note that I will not be leaving those on Windows Phone 7 behind either and will be offering an update to this improved version sometime soon as well. So, due to the slow adoption of Windows 8 tablets/PC's initially I had put this project on the back burner while I worked on more important things (school, work, other stuff), however Windows 8 has begun catching on with Touch centered devices on the rise, a new generation of Surface on the way and Windows 8.1 less than a week away I have picked it back up. Besides writing really long sentences in my spare time I have spent a lot of time working on my design skills and I think you'll agree that the new version of Conqueror for Windows 8 looks a lot better than the other previews I showed off earlier. The new version is actually running stably right now, which is already a significant improvement but it also offers some rather fancy new features (see OP for details). Hopefully find the app as useful as I do. There will be no beta for Conqueror on 8 as I am hoping to release with Windows 8.1 (October 18th) and in fact 8.1 is required for this version of Conqueror (don't worry, upgrading to 8.1 from 8 is free). If you have any input on the new design I'd love to hear it as a similar design might be popping up in two other projects I am working on. This isn't for Windows phone though? No, this is for Windows 8. Which means Tablets and PCs. i often play on my daughters laptop and she has Windows 8. let us know when it's up and i'll give it a try. Sorry for the delay, I've been preparing all of my Conquer Club tools/apps to be released as source on GitHub. The app is now available on the Windows Store with a download link in the original post or here. You can use the request a feature button in the app or post here if there is something you'd like to see added. Alternatively use the Report a Bug button to report a bug in the app. You can also grab the source and play around with that from GitHib here. I now have Windows 8, and I have a x64 bit system, but it says that I can't download it due to my system not meeting the minimum requirements. I don't know what would cause that to happen, my app supports ARM, x86 and x64. I have tested it on all three and so has Microsoft. The app is for Windows 8.1 (a free upgrade for all Windows 8 users). You can get it from the Windows 8 Store, just click it from your Start Menu or All Apps page. I would guess this is the error. As Windows 8.1 is a free upgrade from 8 and includes a number of updated API improvements, fixes and new features it made sense to skip over Windows 8.0 support. If that doesn't work, PM me and we can try to figure it out. runewake2 wrote: I don't know what would cause that to happen, my app supports ARM, x86 and x64. I have tested it on all three and so has Microsoft. Makes sense it was for Windows 8.1. I just got my new Asus laptop today with Windows 8 and it's different, I'll say. It wont take long for me to have Virtualbox running OS X Mountain Lion and maybe devoting some time to fixing the iphone app. That is, if I can get used to not having a start menu, lol. Hyper-V (Microsoft's VirtualBox) is included with Windows 8 pro. Also, I've been exploring Xamarin. Hoping for other platform news soon but my current apps and other projects are eating my time. 8 takes a bit to get used to, but I actually prefer it (especially after 8.1) to 7. Cheers! When Windows 8 launched in 2012, many of the touchscreen devices it was planned for were simply not available for purchase. Those that were accessible were careful too expensive against the price of the competition. Android app development services pro Windows 8 users the decision to upgrade to Windows 8.1 should be comparatively easy given the many advantages listed below. This upgrade is FREE which will be welcome news and is available at Windows Store.